I'm running out of time on every corner of my life. No it does not mean my life is passing by, it means I had and have a couple of very important things to do last week and the next days that I even do not know what my name is. But when I will work hard the next few days I will get the reward next weekend when I am leaving the country for a couple of days. I already booked the plane tickets and now I am trying to discharge the things I have to do. I have so many stuff I'd like to post, stuff of friends', stuff of mine but I have absolutely no time for it. So I'll start with the newest one - clarified butter. I see no reason to repeat the Wikipedia article here, so check it HERE. I use clarified butter for a better taste of some dishes - for example pancakes because of its' higher smoke point. It took me about 40 minutes to clarify and filter the butter. For sure it's possible to buy clarified butter in the grocery BUT (a) I am not sure what kind of low quality butter they use and melt, - I can decide myself which good quality butter I want to buy, (b) they add conservants, and finally (c) the price is too high for such a fast and easy thing to do at home. 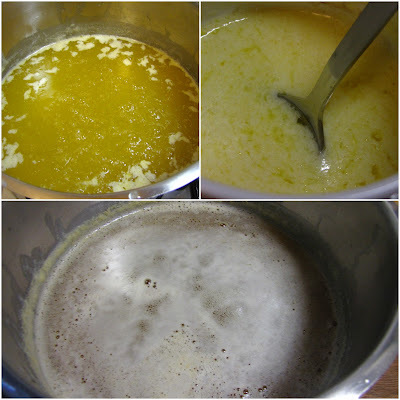 I made clarified butter out of 1 kg (something more than 2 lbs) butter. It makes no sense to use a lower amount of butter. I put it to a pot with a thick bottom (my favourite Fissler pot) and I started to melt it on a small flame. After a while you will get some foam which I removed with a spoon. 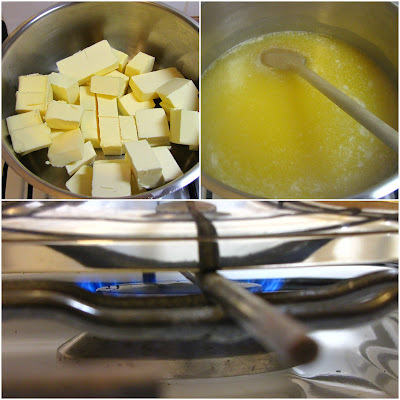 I kept cooking the butter for the next about 10 minutes on a small gas flame to get rid of the evaporating water. I agitated the butter from time to time. You will hear that specific sound of evaporating water. I knew that the butter was clarified and ready after the sound of evaporating water was gone and the melt stopped bubbling. It looked like cold oil which was put to pot. That happened exactly at minute 28 since I switched the stove on. The last thing was the filtering process. I took a sieve and cut a tea filter. Next time I will be smarter to take a coffee filter and some filter paper. It will be easier and faster. 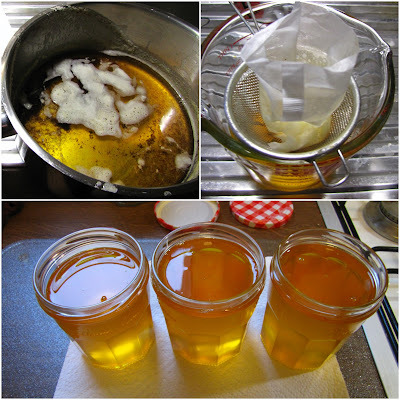 I pour the clarified butter to small jars and left it to cool down. Later I'll close the jars and keep the clarified butter in the fridge. You can keep it for a long time in the fridge - even more than two months and use the butter for cooking or baking. Wikipedia says: It has negligible amounts of lactose and casein and is, therefore, acceptable to most who have a lactose intolerance or milk allergy. Since I do not have the problem I do not care but it's interesting to know. Out of 35 oz (1 kg) butter I got exactly 29 US fl. oz (30 UK fl. oz / 850 ml) clarified butter. After a few hours it will lose the liquid consistency and look like "normal" butter. Read the Wikipedia article and watch the pictures of the process below - they speak their own language. We call this ghee. It's used in a lot of Indian cooking especially Indian sweets. I love the smell of clarified butter.